Lucy steps off the bus a few moments before 4, bounding with energy and the stories she wants to tell us. She’s also hungry — that’s a long school day for a kid who runs hard. There’s a snack time in the morning, lunch just before noon, then nothing else until she comes home. We’ve learned our lesson. We have snack waiting in the kitchen. That girl would eat 8 apples a day, if we let her, so if we hand her one and a hunk of good cheese, she’s happy. She doesn’t have much of a sweet tooth, so homemade graham crackers or banana bread really don’t do much for her. (Her brother, however? Oh, that boy would choose the sweet treat every time.) She finds the texture of celery repugnant, so there goes ants on a log. And at this point in her life, at nearly 8 (what?! ), Lucy prefers the comfort of routine. Please don’t try out any new snack recipes on her unless they are variations on a theme. Lu approves of this seaweed popcorn we made for her recently. We’re making it again, at 3:45 pm, today. The Sonnenburgs suggest we all add more seaweed to our diet, since it’s nutrient dense, high in calcium and the B vitamins. It’s also high in iodine. We don’t use iodized salt in our house — we choose kosher or sea salt instead — so eating seaweed on a regular basis takes care of that need for iodine. We add kombu to our beans when we braise them and to our dashi broth for miso soup, to which we add wakame. And for awhile, at Lucy’s request we had sushi Sunday every week. That’s why we have nori in the house at all times. It’s also because roasted seaweed snack — sheets of nori roasted with oil and salted — is a big hit at snacktime on Vashon. Lucy has spent years crunching on crisp bites of nori. I’ll never forget the time she came home from preschool and told me, “You forgot to pack my seaweed snack today! Everybody had some and I didn’t have any!” That’s Vashon for you. Here in the Pacific Northwest, we’re lucky to have a large Asian population and we live on the coast. Seaweed is pretty easy to find here and frequently used. You might not live in a place where it’s quite as common but nori is worth seeking out or finding online. 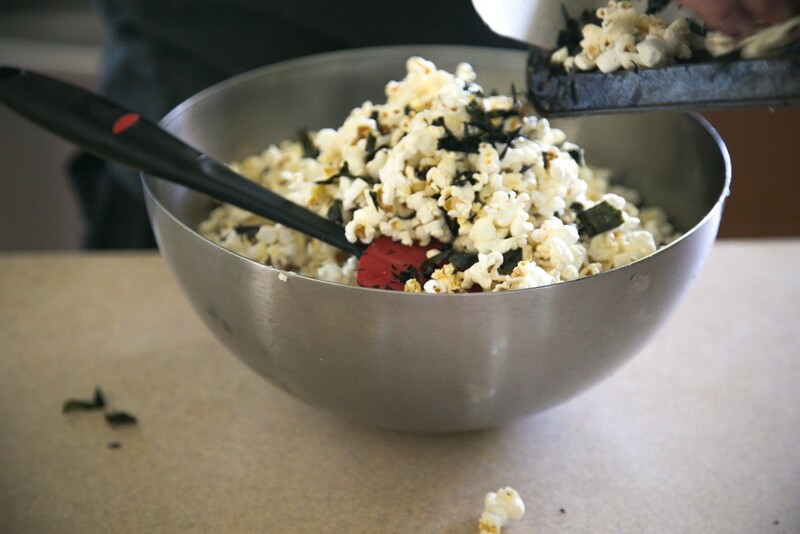 We like adding a bit of butter to our seaweed popcorn. Of course, you can skip it if you want. But when we first tried this popcorn, popped in the pan with sesame oil, shaken together with the nori on a sheet tray, and still hot, Danny and I both tasted cheddar cheese. It’s not there when the popcorn is room temperature but it’s an unexpected taste. With such a simple technique and so few ingredients, paying attention matters even more. When you make popcorn on the stove, there’s something rather satisfying about shaking that pot around and around on the burner, to prevent burning, and feeling the corn pop against the sides of the pot. Desmond is fascinated by it. Give it a few more years and he’ll be the one doing this for us. Great food doesn’t need to be wildly inventive or never-before-seen to be good. Is that even possible at this point? Us? We have about 5 snacks that work around here, time and again, with popcorn being almost top of the list. From now on, we’re throwing seaweed in it. All you need is a good popcorn. We’re fond of Arrowhead Mills white popcorn, which is certified gluten-free. Good butter helps too. The Sonnenburgs recommend cultured butter for the gut, if you eat butter, so I think this Vermont cultured butter might be worth the splurge. And of course, some high-quality nori. Other than that, time to make popcorn. Prepare to cook. For best results, heat a large Dutch oven in a 400* oven until the pot is hot. This is not necessary or for the faint of heart. But if you happen to be cooking and have the oven on, it makes the corn pop fast to hit a hot pan. Prepare the nori. 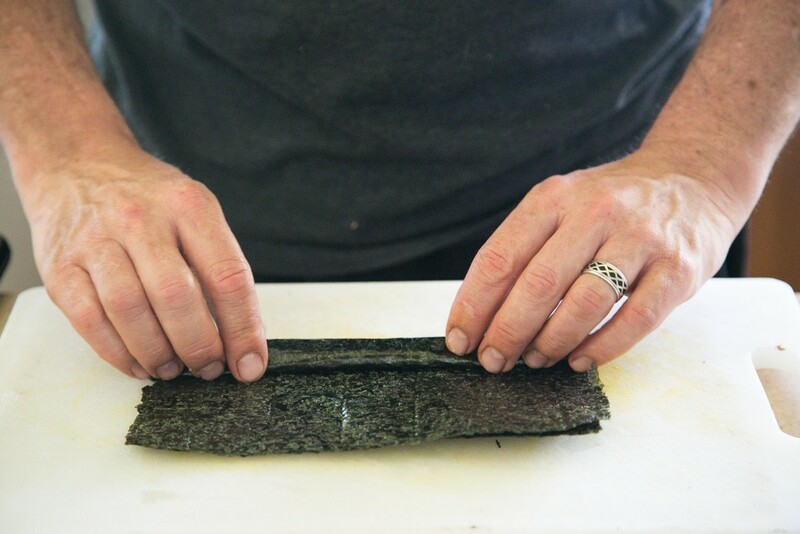 Roll the sheets of nori into a tight cigar shape. With a sharp knife, slice the rolled nori into thin slices, then chop those slices into small pieces. Lay the chopped nori onto a baking sheet. Pop the corn. Set a Dutch oven or large pot onto medium-high heat. When the pot is hot, pour in the sesame oil. When the oil is hot, add in the popcorn. Immediately put on the lid. Listen carefully for the sizzle. In the first few moments, give the pot a good shake once or twice, to make sure the popcorn doesn’t burn. When you hear the first corn kernel pop, pay attention and start shaking the pot around the burner in a circular motion, stopping once in awhile to listen. When the last kernels have stopped popping — and there are always an errant one or two who wait until the last moment — move the pot to the back of the stove. Wait a minute or two before you take off the lid. Finish the popcorn. Set a small skillet onto the burner and turn down the heat to medium-low. Add the butter to melt it. Transfer the popcorn to a large bowl. 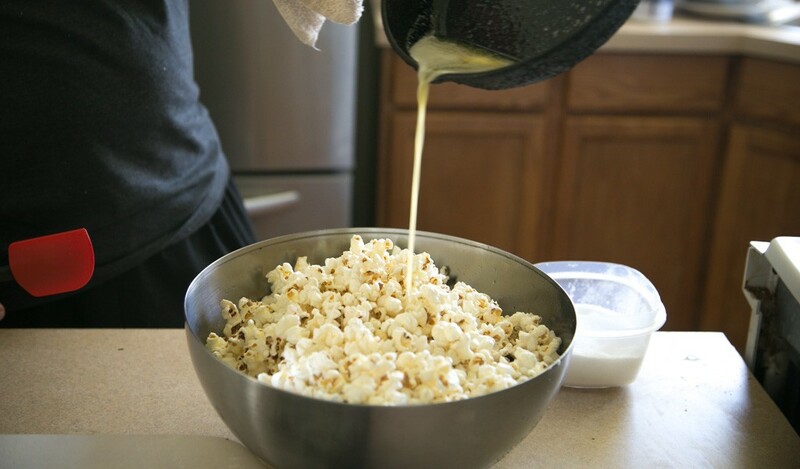 Pour the melted butter over the popcorn and gently toss the popcorn to coat it with the butter. 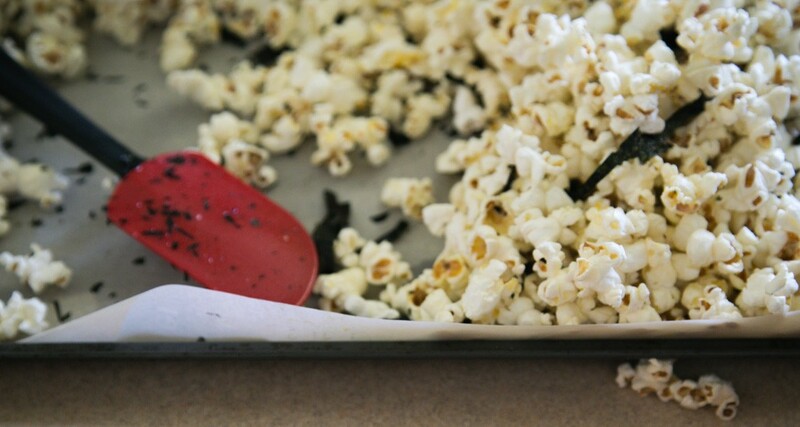 Tumble the buttered popcorn onto the nori slices on the baking sheet and toss the popcorn around until everything is jumbled together. Move the popcorn back to the large bowl and add salt to taste. Eat immediately. Feel like playing? You could use any oil you want here. We liked the taste of the sesame oil with the nori but we’re also big fans of coconut oil for popping corn. 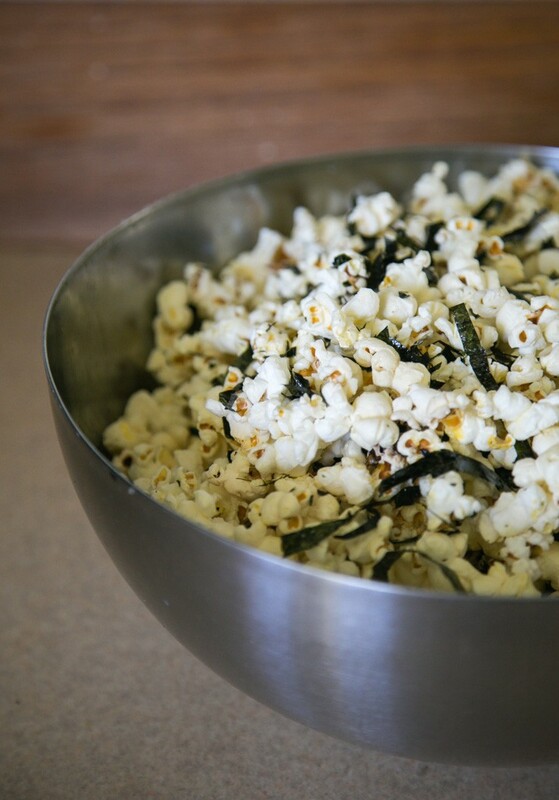 If you wanted to save time in slicing up the nori, simply crumble a small package of roasted seaweed snack onto the popcorn and combine.